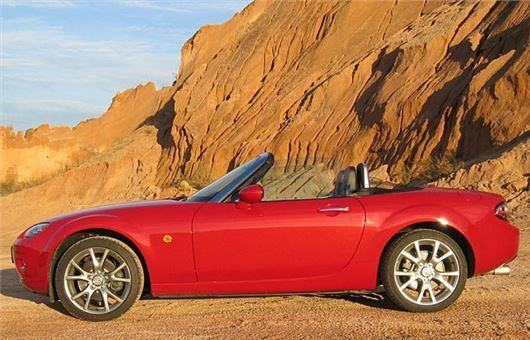 I am thinking of buying a 2006/56 Mazda MX-5 2.0i Sport with 56,000 miles from a Mazda dealer but not sure if I am getting a good deal or not? It looks clean and seems to run well, has done a minimal mileage, apparently two owners (garage demo and then one lady driver), but the dealer wants £5k for it and it is 12 years-old. What do you think? See: /carbycar/mazda/mx5-2005/ Everything there, especially in the Good/Bad section. The most important thing is, can you fit inside comfortably? I have a 2008 Mercedes CLK 200 Kompressor with 83,000 miles, always serviced by same Mercedes dealer. Last service and MoT Oct.2017. Low profile tyres. On occasion, while slowly reversing in my driveway, there is a slight bump in a rear wheel, like going over a small stone. No lights or message on dash, however. The wheels do suffer in this part of Surrey, of course, with so many bad pot holes. Any advice greatly appreciated. Good idea to get the rear tyres checked in case there is some hidden damage to one of them. But the 'bump' might be in the drivetrain: combination of the torque converter and reverse gear taking up the drive. Or it might be the rear differential. I am going to change my 2012 Mitsubishi ASX for something similar, but a little smaller. A petrol engine and 2WD are required. A Suzuki Vitara seems to fit the bill, but what else would you advise should I be considering? Peugeot 2008 1.2 Puretech 130 6-speed with Grip Control. 50mpg and petrol. I read with interest your advice that an automatic gearbox should be put into neutral when the car is stopped both for the gearbox and the fact that the rear stop lights will not shine into the eyes of the driver in the car behind. The time for the situation when you stop behind blinding stoplights on a rainy morning or evening is just about ending. I think that I have just found the answer to this problem. I have just been doing some clearing on the shelves in my garage and have found an old Lucas Flamethrower Spotlight. If I mount this on the top of the car dashboard and switch it on when I am blinded by the three stop lights the driver in front may decide the apply the handbrake. Sorry I mean the parking brake. I wonder though if this will be illegal as it may reduce my forward vision. What happens if the driver of the car in front is seven feet tall, three feet wide, weighs 120 kilos and doesn't take kindly to your spotlight? My stepson is looking to purchase a 2015 Mercedes 2.1 E220 Bluetec AMG 2-door auto with 19k miles. I am advising him to stay away from both diesel and sport models. 95% of his driving is on very short runs, although maybe once a week there is a 35-mile round trip from Warrington to Chester. I also think he may be shocked by insurance premiums, even though he is 39. I am assuming this particular engine requires AdBlue, too, and regular normal maintenance is not one of his strong points. He currently drives a 2012 1.2 Corsa, so I can understand him wanting to move onwards and upwards. A decent petrol car would be much better don't you think? Without a doubt. Diesel coupes have never made any sense to me because the whole point is more status than a 4-door saloon, until you start the engine and the clatter tells everyone you're a tight-fisted skinflint. On top of that, when 4-door saloons, hatchbacks and estate get a bit older they still have practical values. But then the status of a coupe disappears because it's starting to look old-hat, its value goes down the plug-hole. So you're right. Work on him to get a nice petrol engined car. A BMW 3-Series, Golf GTI, that sort of thing. I have a 2010/60 reg Ford Focus Zetec 1600 automatic that has done 25,000 miles and has been fully serviced. I live on a Scottish island, so my average trip is 10-15 miles. It has been an excellent, trouble free car. Is there is anything that I should do to minimise possible automatic drive problems? I think that will probably have the old Ford 4-speed torque converter auto. Check the colour of the fluid on the transmission dipstick. Should be transparent pink. If it's black, it needs changing. Also time to think about changing the timing belt, tensioner, waterpump and alternator belt. And, of course, the brake fluid. We are pensioners who are buying our first new automatic car. Does the new Karoq 1.5 TSI 150 PS engine have problems? You mentioned in your column on Saturday 3rd March a Honda is likely to be more reliable than any of the VW group cars. We have whittled our choice down to the Honda HR-V or the Skoda Karoq. We do not require a diesel, as we have only run petrol engine cars. We have looked at all the main manufactures as we a have problems getting in and out of cars. Both of these makes seem to match our criteria. The HR-V 1.5iVTEC CVT-7 is likely to be more reliable than the Karoq, but slower. The Karoq 1.5TSI Evo has an excellent engine but VAG’s troublesome DQ200 DSG auto. There also seems to be a long delivery date. On return to my car in Manchester airport multi-storey I found it had been entered. There was no damage and the police were too busy, but told me that Volkswagen group cars are prone to ‘Blockers’. On checking websites I found that my car was not the only one, as a Mercedes owner reported an identical incident. Is there a simple way to guard against this when parking? Every car with 'smart' locking is extremely prone to the signal being cloned and the car opened and maybe even stolen. So if your car has a system that automatically unlocks the car as you approach you need to keep the keys in a Faraday pouch that blocks the signal from them so it can't be cloned and boosted. Mercedes keys have a button on them to switch the key off completely when away from the car. I know I am tempting Providence, but I have a 2002 Nissan Micra Twister, with power steering, air conditioning, rear camera, alarm, etc. It can go like the clappers if required, is cheap to run and does not have any red light engine alerts (except low fuel beep), and is just my size. What I will do if it dies I do not know. It has done 100,300 miles. I am eighty, still have all my marbles, and could never afford a new car. I did have a s/h Mercedes 140 before this and hated it. It locked me in without telling me, was heavy to handle and the turning circle was not good. The icing on the cake was when the alarm kept going off whilst travelling. I went to the garage in tears. Long live my Nissan. Perhaps we will perish together. That must be a K11 Micra (the 'Mr Blobby' one). A young lad across the road from me was given one for babysitting. I helped him get it going after it had been left sitting for months. Then he passed his test. That was a couple of years ago and, since then, it's been reliable, carting him and his pals around with very little trouble. Chain cam, so as long as the oil is clean that's nothing to worry about. There can be a problem with the mass airflow sensor that is buried inside the throttle body and might mean a new throttle body. And they can rust out (Nissan didn't build them to last 15 years). Cross your fingers and keep going. My 94-year old mum has a 2001 Yaris and the only real problem she had with that was it needed a new clutch last year. Up until May 2014, my wife and I owned two cars; one insured in her name and other in mine. The car insured in my name was then sold and the insurer (RIAS) issued me with a letter confirming that I had a no claims bonus of 9+ years and no claims made. Since that time we have had just the one car, all the time insured in her name with me as a "named" driver (with LV), and with no claims made. In March, we are taking delivery of a new camper van, which we intended to insure in my name. However, it would seem that the NCD that I had built up no longer applies after three and three-quarter years and I am faced with paying a full premium. Is there any way around this problem? No. That's the system. You are allowed to retain your NCD for 3 years without re-insuring in your name, after which time the privilege lapses. The obvious answer is to insure the camper in your wife's name because she still has her full NCD. I have a 2016 Vauxhall Mokka diesel manual ex-demonstrator bought from a main dealer with 6,000 miles on the clock. I have complained several times that the car sometimes stalls at low speed, particularly when negotiating a corner. The vehicle has been in for testing and I am told that this fault is a known characteristic and nothing can be done about it. The dealer refuses to take the matter further and told me to contact Vauxhall myself. I am not too happy about this. What do you think? The reason is that you are not using a low enough gear for the corner. Depends on the engine but usually below 700-800rpm a diesel engine develops no torque and will not run, so if you try to negotiate a turn in 3rd instead of 2nd and the revs drop below 700rpm the engine will stall. Interested in your comments on selecting N in an automatic when stopped. I always go into Neutral without fail. My new Leon Cupra 300 will not allow this if you have the Automatic Brake switched on, but no doubt you know this already. Frankly I do not like this feature. You only have to touch the accelerator and off it will come which is not very clever of course in a queue of traffic. I am sticking to my standard brake arrangement. Brake hold works differently on different cars. The sensible system has a separate brake hold switch (separate from the parking brake switch). You then have to elect to switch on brake hold when you set off and if you don't want it you can switch it off. But if VAG has fixed its brake hold to prevent selecting N when stopped on brake hold, that makes no sense to me. Just to let you know, I still have my 2001 Peugeot 406 2.0HDI Exec estate, having read about the Peugeot 407 that was its successor. I’m currently at 353,000 miles with no problems at all. Recent exhaust and airflow meter: That’s all in the last 20,000 miles. When they built these cars they were way beyond my expectations in reliability, ao I’m probably going to hang on to her for a little longer. I have a 2010 Audi Q5 3.0 TDI with about 50k miles and full Audi Service History. Generally, it’s in very good condition. However, below 5 degrees in temperature there is a material problem with the steering. It becomes soggy and then jerky, to the point of it being very dangerous when pulling out of corners (it over-steers / then under-steers). This is a real worry when taking my children to school. I have taken it to an Audi garage, requested that they do an inspection and asked for some goodwill given this is a safety issue. (“Out of warranty,” was their stock response). I have now been quoted around £3.5k, plus an inspection fee of £315 for a potential new rack and full steering setup (including a new pump, at nearly £500 for that unit alone). They will confirm this over the next couple of days (could be as low as '£1000' if it's just the pump that has gone). Could you please advise? Given this is safety related, would you normally expect a level of goodwill? Are these costs 'normal'? It feels like I am being taken for a ride by Audi on a 'walk in and needs something doing' basis, even though I feel that this may warrant a recall given a safety issue occurring at under 60k miles of the original warranty. What I do is record all faults reported in carbycar, in this case: /carbycar/audi/q5-2008/?section=good / I have no previous reports of this fault on a Q5, so no evidence for you to take to the DVSA that this is anything other than a one-off issue. Could be water ingress to the rack, for example. Though the car is 7 years old and actually a year outside any supplying dealer or manufacturer Sale of Goods liability, if I was you I would still push for some goodwill, making the point that the car had always been Audi dealer serviced and therefore any sign of this problem developing should have been spotted at a service inspection. I think you will get a contribution, especially if it becomes the worst-case scenario of £3,500. I own a 2013 Skoda Octavia Elegance 1.4 TSI, which I have had from new and with which I am generally well satisfied. It has done just over 14,500 miles. Recently, I noticed when switching on the ignition, the driver's airbag light (centre dashboard) came on and then indicated the driver's airbag was switched off. An orange light on the instrument dial is permanently on when the engine is running, indicating the drover's airbag is switched off, but he performance of the car seems to be unaffected. I went to a good, but non-Skoda, garage near where I live to find out what this problem was and, more importantly, what remedial action might be necessary to return the drivers airbag to "on". This garage has all the electronic diagnostic equipment required to trace the fault on my car, and this indicated that the Multiple Collision Brake System on my car had "no function". However, it has not proved possible, so far, to find out what actual steps need to be taken to return this brake system to correct operational performance. I obviously want the system to work as Skoda intended, but where does my mechanic start to look on the car for the reason for this malfunction, and the steps that need to be taken to return it to correct operation? I have worked through your extensive FAQs to see whether this information is already available, but have not found any. Can you offer any guidance that will help me and, more importantly, my mechanic, find out what parts/steps need to be taken to achieve a repair? Is this a known problem on Skoda Octavias at 4/5 years old, and has there been any recall which I might have missed, in which case do I need to contact Skoda UK? Do I need to travel some considerable distance to an official Skoda dealership to sort this out? Finally, if no remedial action is taken, will this prevent my car from passing its MOT? If GR from Warrington wants his sone to get a decent performance car that's stylish without breaking the bank, might I suggest a Seat Leon SC in 1.4 TSi (petrol) ACT 150 FR format. Its essentially the same as the Golf GT 3dr underneath (both great looking - I prefer the Golf overall as its nicer inside, but not THAT much) but you get more bang for your buck - climate controlled AC as standard for a start and is at least £3-£5k cheaper than the Golf when new, even more when discounts come into it or you buy via a broker. Just as good handling as the Beemer at road legal speeds and is more than swift enough for most people, plus has the added bonus of decent mpg due to the COD feature and decent mid-range punch that doesn't require you to floor it to make progress like normally-aspirated cars. Oh, and about 2/3rds the price to buy and insure of the BMW. Less cache in the work car park, but not THAT much. Just make sure they find a decent main dealer to get it looked after at, and don't get a DSG auto box - go for the manual only. I sympathise with GB about being blinded by brake lights; practically EVERY day I am out driving, come to a queue at a junction or at traffic lights, and I seem to be the ONLY one using their handbrake. A few weeks ago, I was sat behind fourteen cars at a set of temporary lights that I have timed at nearly 5 minutes to complete 1 cycle (3 way on a main road junction); every single car was sat on the brakes for the entire time, facing uphill. No wonder half of them have broken LED brake light clusters, and brake light bulbs. I have recently seen several complaints across different media about individuals being "blinded by brake lights" whilst waiting at traffic lights. I'm not sure what triggered this issue, but it is hard to believe that any able driver could actually be "blinded" by relatively low lumens brake lights, even at night. If this was true, how on earth would they cope with higher light intensity on-coming headlights? And if so easily "blinded by brake lights", then they must surely be medically unfit to drive. Or is this just a trivial irritation, blown out of all proportion? On return to my car in Manchester airport multi-storey I found it had been entered.....keep the keys in a Faraday pouch that blocks the signal from them so it can't be cloned and boosted. Some booster if it worked all the way from Manchester to Spain, Dubai, Las Vegas? Joking aside, considering what you pay in airport car parks can't the owners pay for regular patrols to deter or question suspicious characters hanging about? My battery on my Mk5 Golf was draining & I discovered eventually when pulling fuses that 2 doors were not even locking from the key fob, despite everything looking fine and a healthy clunk could be heard.. I suspect some may have their cars entered due to this. Apparently a common VAG fault and unfortunately a £200 fix per door with genuine parts. 2013 Audi A1 Sportback S Line, S-tronic 36,500 fully serviced. Car has been amazing for almost 3 years. A few weeks ago I stopped at a red light, perfectly normal procedure and the mechatronic failed in the dry clutch S Tronic. No warning lights prior, no vibrations, no hesitation/delays at junctions. £2500 to repair. Fortunately the Arnold Clark purchased warranty gave authority to fix immediately. I have since attempted to buy numerous other Audi’s with a wet S Tronic but they won’t give a warranty period longer than 12 months. Back to the torque converter boxes I go!!! !